Welcome to Coastal Alaska Adventures! We offer a multitude of hunting opportunities in a vast array of areas and on our fleet of different vessels. We have spent the last 30 years working to build the number one hunting operation along the vast coastlines of SE Alaska. We have spent millions of dollars to secure concessions in the top areas and the best vessels to offer these luxury Alaska boat hunts. We like to say we offer hunts for a range of taste, budgets and desires. All our hunts are in excellent areas, some a little better, but none are bad. We offer hunts from three distinct vessels in these areas. The newest addition to our fleet is the 100-foot luxury yacht “Golden Eagle”. The Golden Eagle was custom built for Budweiser Brewing Company for it’s corporate staff and clients, originally being called the Double Eagle. 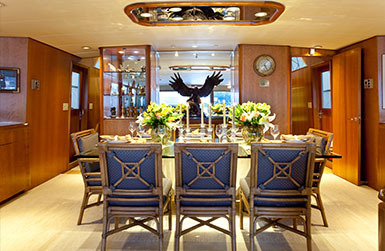 Take note of the beautiful bronze eagle sculpture aboard the vessel given her original namesake. 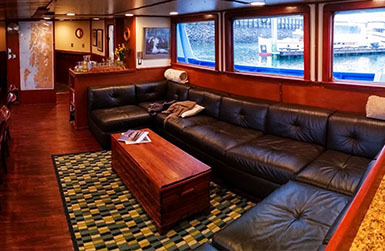 From it’s beautiful teak wood decks, to it’s massive windows allowing for full views of the Alaska wilderness you will find this vessel to meet your every need. The Golden Eagle boasts four full size staterooms, each with walk in closets, built in dressers with ample space to comfortably unpack into- making yourself at home while cruising and en suite bathrooms with full vanity and walk in showers. Each room is maintained daily by the onboard steward to insure a comfortable stay. the Northwest most renowned ship builders, and while finished for luxury, it was built tough. Ever seen the Deadliest Catch? 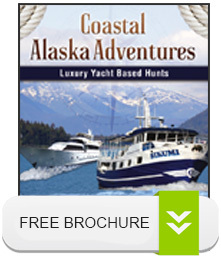 The Sikumi was built by the same builder as many of the vessels you see on this famous show about Alaska seas. MV Sikumi ‘s sturdy lines make for a smooth safe ride in any seas, outperforming many vessels twice the size. The interior of the Sikumi is well laid out and meticulously maintained. It boasts four guest rooms, each with a queen bed, private bath and head, and optional fold down single bed. It has a full size commercial galley for our amazing chefs to provide first class meals. Separate crew quarters and lots of shop and outdoor space make the Sikumi unbeatable for comfortable and luxurious Alaska hunts.